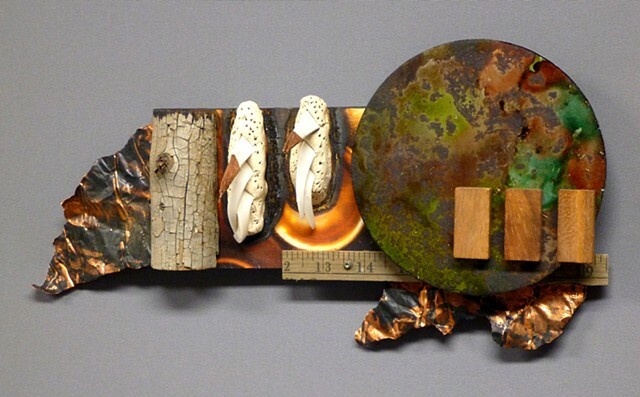 A chunk of tree branch, a yardstick piece, an alcohol-dyed metal disk with three wood blocks arranged on it and two flags of copper are joined with two sets of kiln cones Jill Smith gave me. She says it's bad luck to throw them away so she was thrilled when asked for some. I have more than just these two so I'll probably have to use them over the next few years or I'll have bad luck, right? So here's what Wikipedia says about them: "Pyrometric cones (kiln cones) are pyrometric devices that are used to gauge heatwork during the firing of ceramic materials." Now you know. Oh, I put little copper pointy things on them because it makes them look sweetly malevolent.